The walls are perceived usually as a dim background where the main plot of the house story is created by bright and vivid strokes of the furniture, accessories and objets d’art. That is the reason why the walls are dressed in finishing agents in neutral colors and textures. However, to star these surfaces is to get the unprecedented and striking interior. Designers got a three-room apartment with small rooms to redesign. The decision on redevelopment was put aside: the location of all rooms was just fine for the homeowners. 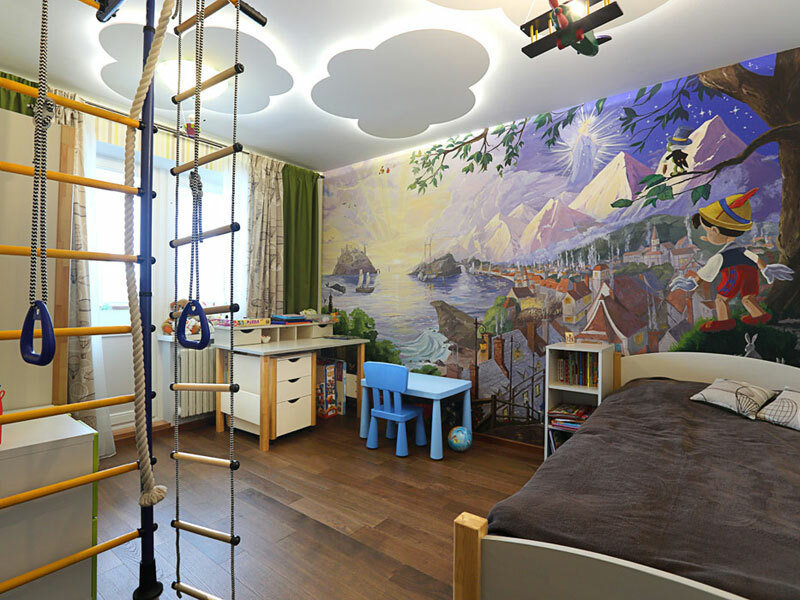 Furthermore, it was necessary to keep two single bedrooms: nursery and parents’ room. Therefore, the designers decided to take the one and only measure and build the wall in the future living room. Semicircular structure not only improved the shape of the biggest room but also allowed creating the formerly missing wardrobe. Separate storage room helped to forget about bulky and heavy wardrobes in bedrooms. The rooms were furnished by the space-saving furniture. Therefore, in spite of the small space, there is no feeling of the space shortage. However, the styling of walls in different techniques became the main touch of the visual expansion. The anteroom welcomes us with the views of Paris streets. 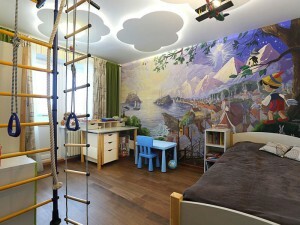 The living room is adorned with futuristic murals, and the nursery has the fairytale painting. Snow-white 3D panel was made just for the kitchen. The chosen decision widens the perspective and creates the appealing effect of the window into the parallel world. To incorporate the interior, every room uses the similar range of colors where brown and purple shades serve as a base for everything. Coswick hardwood flooring strengthens the visual uniformity of the apartment. Designer’s commentary: Homeowners longed for a certain peculiarity in every room. They are creative and very imaginative. That is why they easily approved the daring decision on walls design. 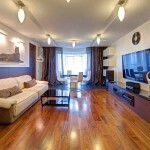 As a result, they have got the bright interior where all rooms have their own mood and behavior.